نوزاد خلیل, توحید, متقی, سیدخلیل. (1396). بررسی هندسه مرزهای ناپیوستگی در مکران ساحلی با استفاده از مهاجرت و مدل‌سازی توابع گیرنده. مجله ژئوفیزیک ایران, 11(3), 157-173. توحید نوزاد خلیل; سیدخلیل متقی. "بررسی هندسه مرزهای ناپیوستگی در مکران ساحلی با استفاده از مهاجرت و مدل‌سازی توابع گیرنده". 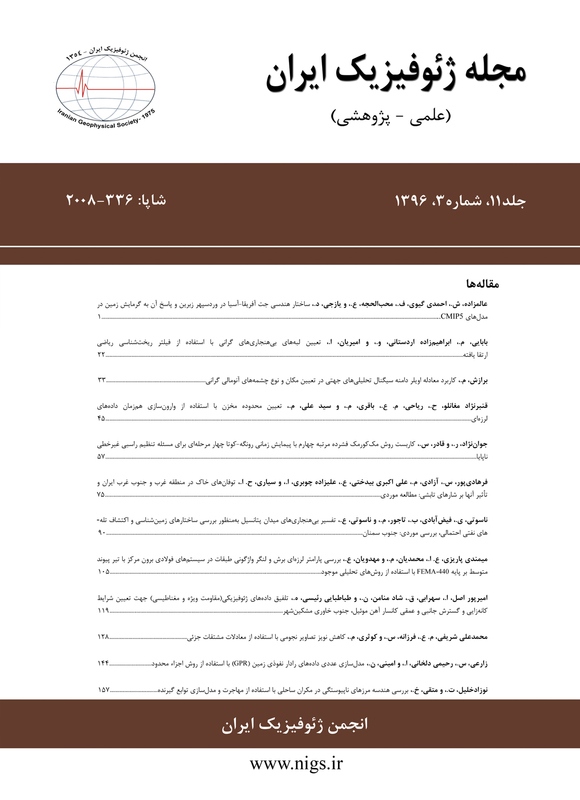 مجله ژئوفیزیک ایران, 11, 3, 1396, 157-173. نوزاد خلیل, توحید, متقی, سیدخلیل. (1396). 'بررسی هندسه مرزهای ناپیوستگی در مکران ساحلی با استفاده از مهاجرت و مدل‌سازی توابع گیرنده', مجله ژئوفیزیک ایران, 11(3), pp. 157-173. نوزاد خلیل, توحید, متقی, سیدخلیل. بررسی هندسه مرزهای ناپیوستگی در مکران ساحلی با استفاده از مهاجرت و مدل‌سازی توابع گیرنده. مجله ژئوفیزیک ایران, 1396; 11(3): 157-173. منطقه مکران بخشی از فرورانش فعال حاصل از همگرایی صفحات عربی و اوراسیا است. زاویه مخروطی کم و ضخامت زیاد رسوبات در منشور افزایشی از ویژگی­های متمایز کننده این منطقه هستند. در این مطالعه، ‌با استفاده از داده­های جمع­آوری شده در منطقه مکران ساحلی توسط ایستگاه باند پهن چابهار توابع گیرنده P و S و با استفاده از چهار ایستگاه کوتاه دوره، تابع گیرنده P محاسبه شد. مهاجرت به عمق توابع گیرنده P نشان می‌دهد که یک مرز (احتمالاً مرز موهو) در عمق 27 کیلومتری در زیر ایستگاه چابهار قرار دارد که شیبی اندک، در حدود 5/2 درجه، رو به شمال دارد. بررسی تغییرات دامنه فاز‌های تبدیلی بر روی مؤلفه‌های شعاعی و مماسی تابع گیرنده P در ایستگاه چابهار وجود یک لایه ناهمسانگرد تا عمق حدود 9 کیلومتر که احتمالاً مرتبط با رسوبات فلسی شکل در گوه برافزایشی است را تأیید می‌کند. مقدار عمق‌های تخمینی 9 و 27 کیلومتر برای رسوبات و مرز موهو از مدل‌سازی هم‌زمان تابع گیرنده و منحنی پاشش محاسبه شده است. محاسبه و برانبارش توابع گیرنده ‌S برای ایستگاه CHBR یک پالس منفی با تأخیر زمانی 10 تا 13 ثانیه (متناسب با عمق 80 تا 100 کیلومتر) را در زیر این ایستگاه نشان می‌دهد که می‌تواند مرتبط با مرز لیتوسفر اقیانوسی با استنوسفر باشد. We analyzed the teleseismic data gathered by a broad-band (CHBR) and four short-period (CDK, CNT, KHB, KSM) seismometers, located in western coastal Makran, north of Chabahar, Iran. The data were gathered by the roughly north-south direction quasi-linear profile and used to calculate P (for all stations) and S (only for CHBR) receiver functions utilizing iterative deconvolution technique of Ligorria and Ammon (1999). Because of backazimuth gaps in south and western directions, we used PKiKP and Pdiff phases to calculate receiver functions in a similar processing approach. Calculated P receiver functions are migrated to depth to clarify the geometry of velocity boundaries at the base of sediments and Moho. The result shows that there is a dipping interface lying at a depth of 27 km (beneath CHBR) to 31 km (beneath CDK), which imply a 2.5o dipping Moho boundary beneath the study region. To avoid the trade-off between velocity model and reported depth, we jointly modeled the stacked receiver function, and group velocity dispersion curve for CHBR and the output model was considered for any time to depth migration of receiver functions. We analyzed the effects of P and S anisotropy on teleseismic converted waves to map the presence, the strike, and the depth of anisotropic structures. High-resolution PRFs are considered for such analysis. The following criteria are considered to select the high-quality receiver function (Schulte-Pelkum and Mahan, 2014): the signal-to-noise ratio of the three components of the seismograms is at least 1.5; the convolution of the PRF with the vertical component of the seismogram reproduces at least 60% of the horizontal component (defined as variance reduction by Ligorria and Ammon, 1999); the PRF shows a positive polarity direct P arrival; the receiver function amplitude does not exceed 1; any arrivals’ pulse length does not exceed 3.5 s. The latter two criteria are employed because very high amplitudes and long oscillatory pulses are typical characteristics of an unstable deconvolution (Schulte-Pelkum and Mahan, 2014). The calculated PRFs were then binned in 5° azimuthal groups with 5° overlap. In CHBR station, we recognized signs of the top (at 1 km depth) and bottom (at 9 km depth) of an anisotropic layer with almost north-south anisotropic symmetry axis. In addition, we recognized a flat interface beneath CHBR station at 27 km depth that is not in consistency with the result of migration to a depth of RFs showing a 2.5o dip Moho at the same place. For this reason, we utilize forward modelling to calculate synthetic PRFs to explain periodic amplitude variation of P to S converted phases with back-azimuths in each station that could be a signature for anisotropic velocity features. The forward modeling indicates that the horizontal interface makes a similar pattern on simulated PRfs as a low angle dipping interface with dip less than 10o. Migration of S receiver functions reveals a deep velocity discontinuity at depth around 80 to 100 km that might be considered as a shallow lithosphere-asthenosphere boundary beneath the study region. آقانباتی، ع.، 1383، زمین‌شناسی ایران، نشر سازمان زمین‌شناسی و اکتشافات معدنی ایران، تألیف. Acton, C. E., Priestley, K., Gaur, V. K., and Rai, S. S., 2010, Group velocity tomography of the Indo‐Eurasian collision zone: Journal of Geophysical Research: Solid Earth, 115(B12). Cassidy, J. F., 1992, Numerical experiments in broadband receiver function analysis: Bulletin of the Seismological Society of America, 82(3), 1453-1474. Chen, L., Wen, L. X., Zheng, T. Y., 2005a, A wave Equation Migration Method For receiver Function Imaging, (I) Theory: Journal of Geophysical Research, 110, B11309, doi:10.1029/2005JB003665. Chen, L., Zheng, T., and Xu, W., 2006, A thinned lithospheric image of the Tanlu Fault Zone, eastern China: constructed from wave equation based receiver function migration: Journal of Geophysical Research: Solid Earth, 111(B9). Herrmann, R. B., 2013, Computer programs in seismology: an evolving tool for instruction and research: Seismological Research Letters, 84, 1081–1088. Hessami, K., Jamali, F., and Tabassi, H., 2003, Major Active Faults of Iran. Edition 2003: International Institute of Earthquake Engineering and Seismology. Julia, J., Ammon, C.J., Herrmann, R.B. and Correig, A.M., 2000, Joint inversion of receiver function and surface wave dispersion observations: Geophysical Journal International, 143, 1–19. Kennett, B. L. N., Engdah, E. R. and Buland, R., 1995, Constraints on seismic velocities in the Earth from traveltimes: Geophysical Journal International, 122(1), 108–124. Kind, R., and Yuan, X., 2011, Seismic, Receiver Function Technique. In: Gupta, H. (Ed. ), Encyclopedia of Solid Earth Geophysics (Encyclopedia of Earth Sciences Series): Springer, 1258-1269. DOI: http://doi.org/10.1007/978-90-481-8702-7_12. Langston, C. A., 1977, The effect of planar dipping structure on source and receiver responses for constant ray parameter: Bulletin of the Seismological Society of America, 67, 1029-1050. Levin, V,. and Park, J., 1998, P–SH conversions in layered media with hexagonally symmetric anisotropy, A Cook Book: pure and applied geophysics, 151, 669–697. Ligorría, J. P. and Ammon, Ch. J., 1999, Iterative Deconvolution and Receiver-Function Estimation: Bulletin of the Seismological Society of America, 89(5), 1395-1400. Menke, W., 1989, Geophysical Data Analysis: Discrete Inverse Theory: Academic Press, Inc.
Motaghi, K., Tatar, M., Priestley, K., Romanelli, F., Doglioni, C., and Panza, G.F., 2015, The deep structure of the Iranian Plateau: Gondwana Research, 28, 407–418. Motaghi, K., Shabanian, E., Tatar, M., Cuffaro, M., and Doglioni, C., 2017, The south Zagros suture zone in teleseismic images. Tectonophysics, 694, 292-301. Schulte-Pelkum, V., Mahan, K. H., 2014, A method for mapping crustal deformation and anisotropy with receiver functions and first results from USArray: Earth and Planetary Science Letters, doi: http://dx.doi.org/10.1016/j.epsl.2014.01.005. Smith, G., McNeill, L., Henstock, T.J., and Bull, J., 2012, The structure and fault activity of the Makran accretionary prism: Journal of Geophysical Research, 117(B7), doi:10.1029/2012JB009312. Zhu, L., 2000, Crustal structure across the San Andreas Fault, southern California from teleseismic converted waves: Earth and Planetary Science Letters, 179, 183–190.